Joining (deep breath) Margot Robbie, Brad Pitt, Leonardo DiCaprio, Burt Reynolds, Luke Perry, Emile Hirsch, Dakota Fanning, Damian Lewis, Clifton Collins, and Timothy Olyphant, Al Pacino has signed on for Quentin Tarantino’s upcoming film about the Charles Manson murders. Even for a director who has traditionally pulled any actor he wants, this is getting ridiculous. 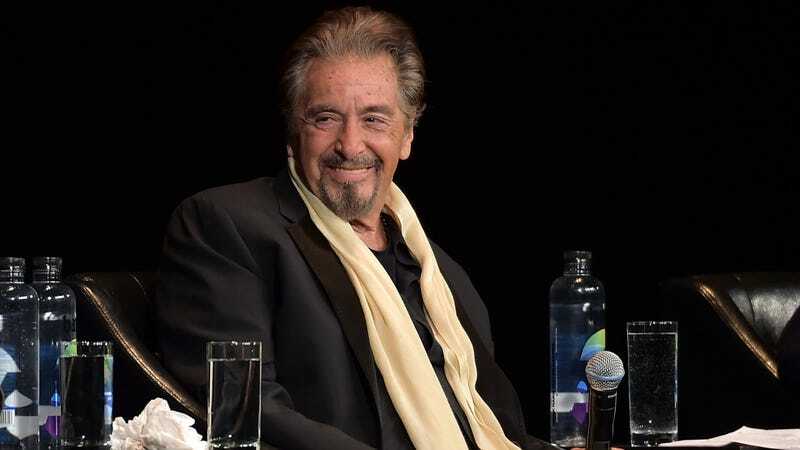 According to Variety, Pacino will play Marvin Schwarz, the agent of down-on-his-luck actor Rick Dalton (DiCaprio). It marks the first collaboration between Tarantino and Pacino, but it’s a pretty enticing pairing given the way the director has traditionally been able to coax performances out of iconic actors that at once re-contextualize and enshrine the very qualities that made them famous in the first place. That certain “Pacino-ness” will probably be used to good effect, in other words. Once Upon A Time In Hollywood is currently set to premiere August 9, 2019—the fiftieth anniversary of the killings. We eagerly await news of Beyoncé, Clint Eastwood, Haley Joel Osment, the Wal-Mart yodeling kid, Will Smith, Reese Witherspoon, and Sandra Bullock joining the cast.